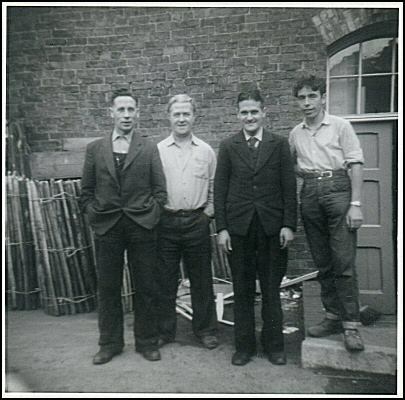 This picture was taken in the 1950's in the works yard of the hospital (L to R) Jock Mclaughlin, Jack Lunn, Walter, Henry Challesworth. 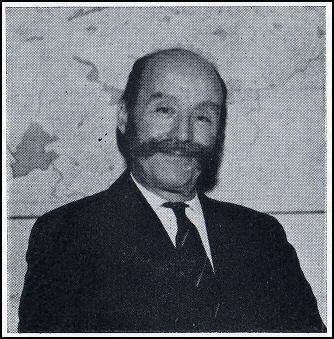 Photo supplied by Margaret Hague. 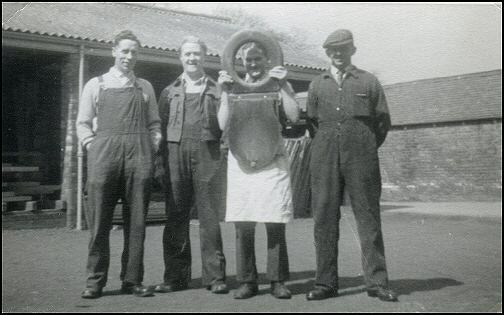 Outside Joiners Shop in the 1960's. 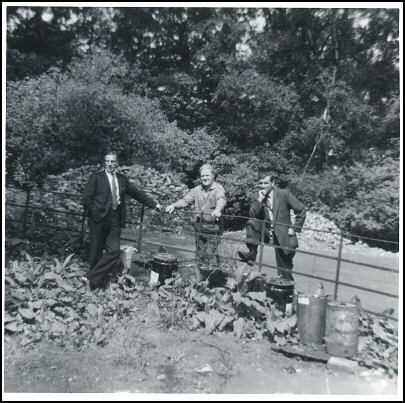 (L o R) Jock Mclaughlin, Jack Lunn, patient, Alan Fowler ---- Hospital grounds in 1960's (L to R) Alf Wilkin, Jack Lunn, Bill Berrisford. What is laundry? 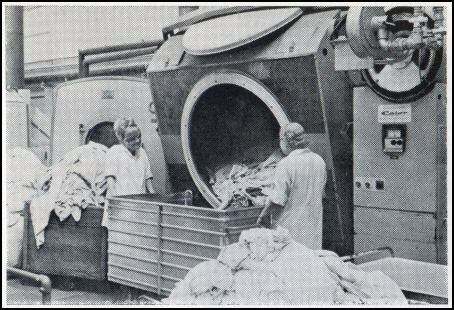 Middlewood laundry served 15 hospitals or hospital units in all. The service provided the whole range from the cradle to the grave one might say. Some 92,000 articles per week were processed by a staff of 45, who worked from 7.30am to 4.15 pm with voluntary shifts on Saturdays mornings and occasionally working Bank Holidays as well. 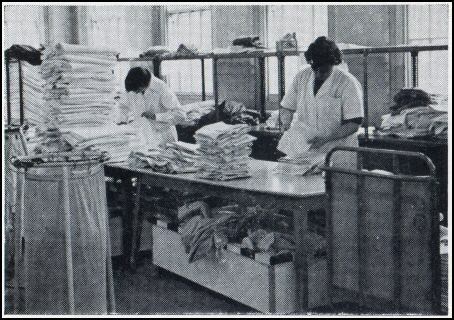 Work was collected daily from most of the hospital units and three times a week from some smaller units. There was a colour system in place to identify different units; Wharncliffe in blue bags. Middlewood and the peripherals hospitals in green bags. Barnsley in white bags. A typical washing machine was capable of a 200 pounds load taking 40 minutes. 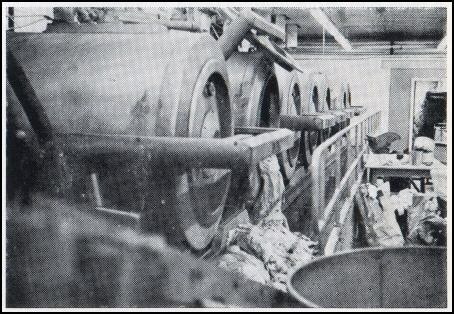 The extraction of the water process took 4 minutes and the tumbling took 7-20 minutes depending on the items inside. After tumbling, the clothes went to be calendered or pressed. What happens when laundry arrives? 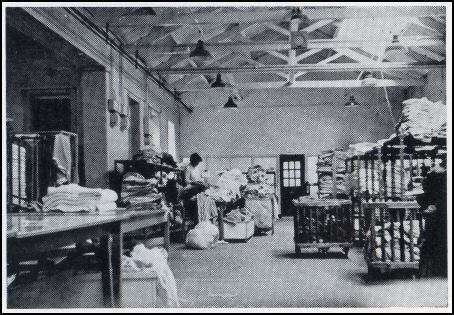 First of all, It was received at the back entrance of the laundry and then tipped out of their bags onto a conveyor belt and was carried up to the sorting room. 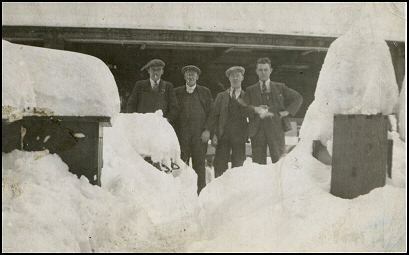 Here, three members of staff sorted and loaded them into hoppers which fed the machines downstairs. Each hopper took a certain type of article and then weighted. 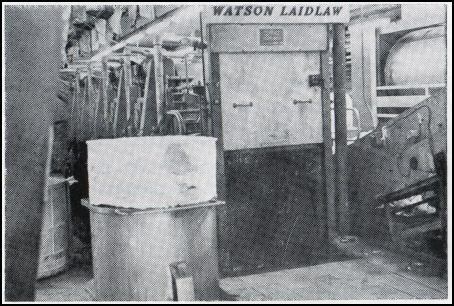 A specially punched card indicating he washing machine programme and its contents was attached to the hopper. The washing process. 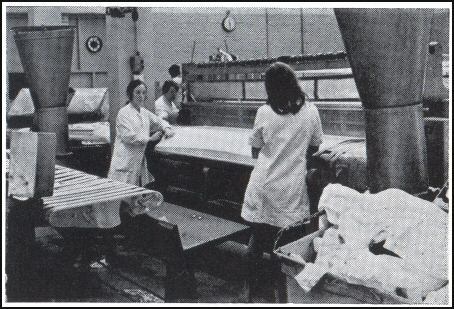 After the garments are washed and rinsed, the machine empties its loads on to a conveyor belt which carries the items into a steel drum, which is then wheeled into the extractor plan. A giant ram-rod, exerting a pressure of 1,150 lbs. per square inch, then squeezes the excess water from the garments. 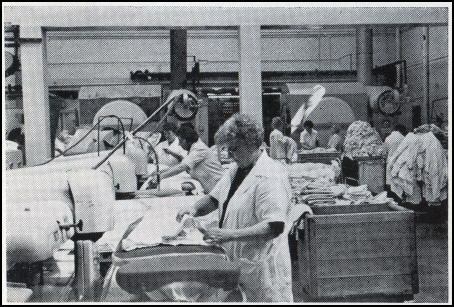 At this stage all garments looked like a giant cheese which is then wheeled into the tumbler room to be dried in giant tumblers. 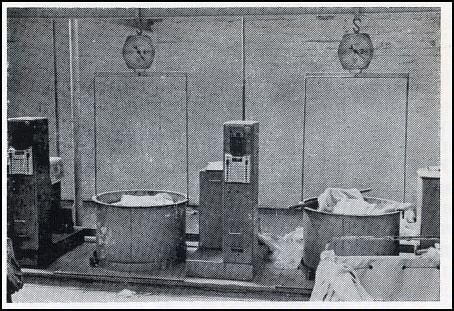 Currently on trial there is a washing machine capable of doing 800 lbs of washing, if the test is successful the manufacturers will no doubt be able to go ahead with the sale of more of these gigantic machines. 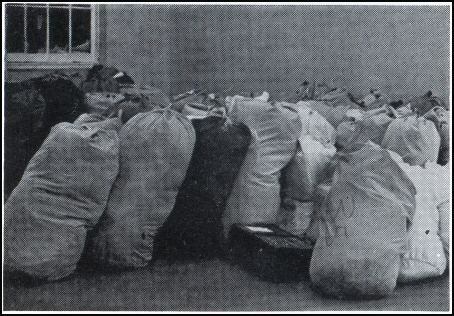 After the items are clean, they are sorted, placed in appropriate bags and located to particular wards. They are then taken to the dispatch department where there is usually a lorry or a van. 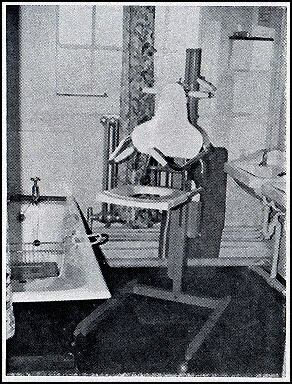 This picture looks like a lavatory seat on stilts, but is nothing less than a very helpful and labour saving device for handling patients who are very heavy and unable to help themselves. Its real name is a Macanaid Ambulift which was used in Wharncliffe and Middlewood Hospitals. The Mecanaid in use on Ward D at Wharncliffe Hospital. After 22 years service, Jack and his wife moved to St Annes in Lancashire where they spent their retirement. Jack hoped to give more time to his hobby of music. Miss ROME. Assistant Matron at Aughton Court. Miss Rome commenced her service at Middlewood in 1934 and after qualifying in 1938 became successively a staff Nurse and ward Sister. 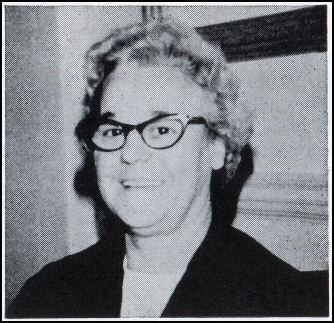 After three years break from service, she returned to Middlewood in 1960 where she was appointed Assistant Matron to the Aughton Court Hospital and stayed until retirement. I have received several e-mails enquiring about my connection with this hospital. Well, I started to work here in 1991 as a part time House Keeper. 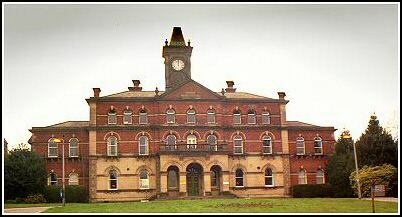 At the time, many wards and buildings within the hospital site were already closed. The reallocation of existing patients to other parts of the city was in full swing. I think this legal process was called "Care in the community". I have to admit now that one of my biggest regret in photography was not being able to record the life inside these magnificent buildings. I did not see any significant importance then. 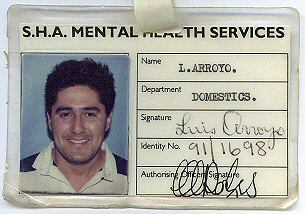 My identification badge at the time.